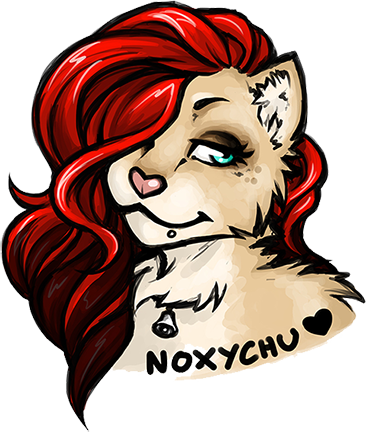 My name is Sarah Schnau, but I’m more commonly known as Noxychu. I am a Freelance Portrait Artist and I was formerly an employee of the World of Warcraft Database website known as Wowhead, creating miscellaneous illustrations and logos. I am now working for the awesome Editorial website known as Blizzard Watch. Born in the United Kingdom, I immigrated to the USA in 2011 and I’m currently living in North Texas. I have been drawing for most of my life and attended an art school/college back in England. I’ve also recently been featured on the official Warcraft website in a Community Spotlight! As a Warcraft Fan-Artist, I had already been drawing a lot of anthro species including Draenei, Tauren, and Arakkoa (goat, cow, and bird respectively), so taking the leap into the Furry genre was an easy one! As such, I’m still relatively new to it, but I have absolutely fallen in love with the friends and clients I have have gained. This year was my third attending Texas Furry Fiesta as a dealer, but I have also joined them on Staff doing some work with Theme and Decor. This year at Mephit Fur Meet is my first time ever being invited as a Guest of Honor, and I am super excited to be here!